We have a hypothetical data file, ztp, with 1,493 observations available: ztp . 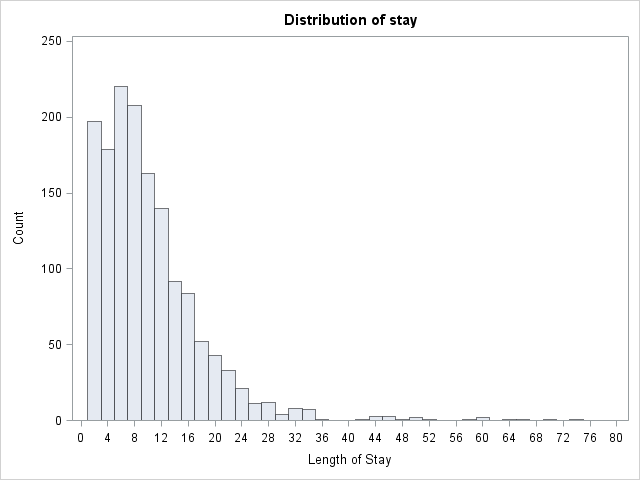 The length of hospital stay variable is stay. The variable age gives the age group from 1 to 9 which will be treated as interval in this example. The variables hmo and died are binary indicator variables for HMO insured patients and patients who died while in the hospital, respectively. In order to use proc nlmixed to perform truncated Poisson regression, we must supply it with a likelihood function. We supply the last two equations to proc nlmixed to model our data using a zero truncated Poisson distribution. Additionally, proc nlmixed does not support a class statement, so categorical variables should be dummy-coded before running the analysis. Towards the top is the iteration history, giving the values of the log pseudolikelihoods. The last value in the log (-6908.7990731) is the final value of the log pseudolikelihood for the full model. Next comes a number of fit statistics, which can be used to compare the fit of nested models. Below the fit statistics are the zero-truncated poisson coefficients for each of the variables along with standard errors, t-scores, and p-values. The value of the coefficient for age, -.01444, suggests that the log count of stay decreases by .01444 for each year increase in age. This coefficient is statistically significant. The log count of stay for patients who died while in the hospital was .20377 less than those of patients who did not die. Finally, the value of the constant (intercept), 2..4358 is log count of the stay when age = 0, hmo = 0, and died = 0. We can also use estimate statments to help understand our model. 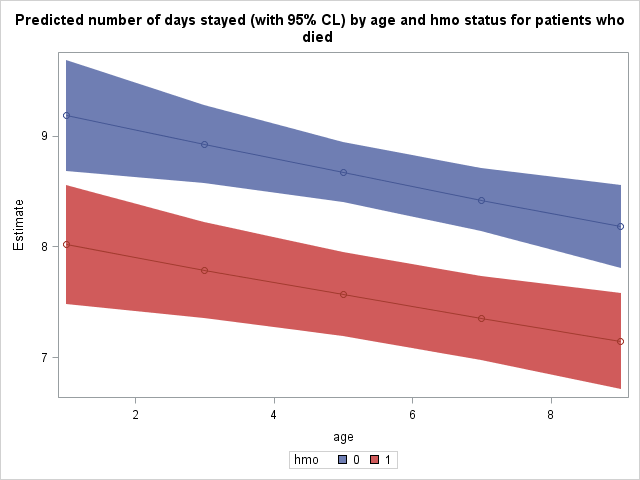 For example we can predict the expected number of days spent at the hospital across age groups for the two hmo statuses for patients who died. The estimate statement for proc nlmixed works slightly differently from how it works within other procs. Here, each parameter must be explicitly multiplied by the value at which is to be held for that estimate statment. Additionally, because we would like to predict actual number of days rather than log number of days, we need to exponentiate the estimate. We can see that the number of days spent tends to decrease as we move up age groups and that patients enrolled in an hmo (hmo = 1) tend to spend fewer days at the hospital as well than those not in hmos. For example, we expect that a non-hmo patient who died in age group 1 to stay for 9.1852 days whereas an hmo patient who died in age group 1 is expected to stay 8.0180 days. It may be illustrative for us to plot the predicted number of days stayed as a function of age and hmo status. To do this, we must tell SAS to save this table of predicted values as a dataset. Tables and graphics produced by procedures are given names upon creation. We will need the name of this prediction table to tell SAS to save it. Place ods trace on and ods trace off statements around the procedure which produced this table to obtain its name. Output from the ods trace statements is located in the log, not the output. Towards the end of the log we find the name of this table, which as expected by its heading in the output above, is “AdditionalEstimates”. We can now tell SAS to save this output table as the dataset “mylib.addest” using an ods output statement. Now we can use this predicted values for plotting. We need to add actual values of age and hmo to the dataset for plotting as well. Finally, we use proc sgplot to plot our predicted number of days stayed as well as 95% confidence interval bands. The predicted values, lines connecting them, and confidence interval bands are all specified separately within the same proc sgplot. The group option will produce separate points, lines, and bands by the grouping variable. As of SAS 9.3, you can use proc fmm to fit zero-truncated Poisson models. You simply specify “dist = truncpoisson” in the model statement. Although compared to proc nlmixed, proc fmm provides a much easier way to specify a zero-truncated poisson regression, it has much more limited postestimation options. For example, estimate and predict statements are not available with proc fmm. Additionally, proc fmm like most other SAS procs, uses the last group within a categorical variable as the reference group. Count data often use exposure variable to indicate the number of times the event could have happened. You can incorporate exposure into your model by including a log-linear term for exposure in the log-likehood function specification.